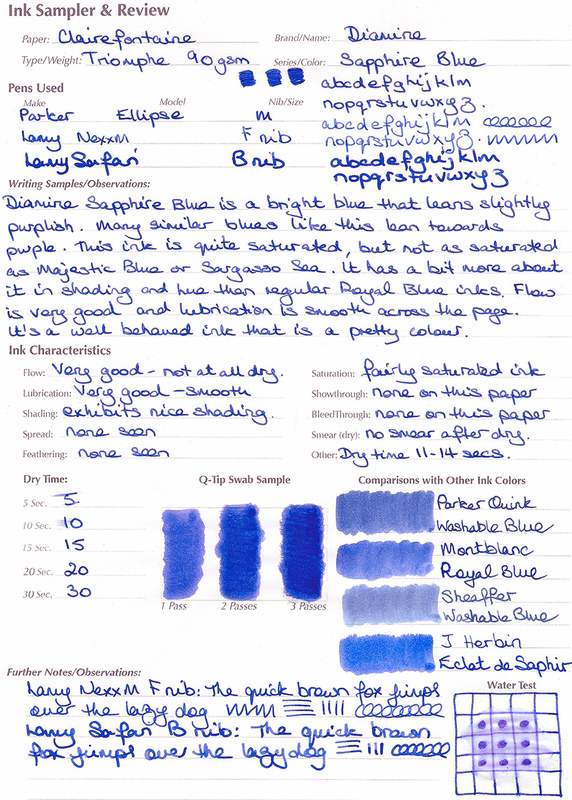 Hello Chrissy here again, and today I’m reviewing Diamine Sapphire Blue ink. Diamine Sapphire Blue is a bright blue ink. It’s a mid range shade that leans slightly purple as many Royal Blue inks tend to do. However Diamine Sapphire Blue is more saturated than many standard Royal Blue inks, although it is less saturated than inks like Cornflower, Tchaikovsky and Majestic Blue. I wrote my review on Clairefontaine Triomphe smooth coated paper, that is not very absorbent, and I saw no spread, feathering, show-through or bleed-through. It’s a fairly saturated ink but I still saw some nice shading. It flowed very well with all of the pens I tried it in, felt neither wet nor dry, and lubrication was nicely smooth across the paper. I found it a very well-behaved ink that was a pleasing shade of blue. It seems to look more purple with wet nibs. Start-up: No start-up problems noticed. No skipping noticed. Dry time: Quick. 11-14 seconds on the 90gsm paper. Nib dry-out: There was no nib dry-out while I put the uncapped pen down to do the comparison ink tests. Nib Creep / “Crud.” Not seen, even after several days in the pen. Clean up: Clean off of hands and out of pens was very easy. Diamine Sapphire Blue is not sold as a waterproof ink but exhibits some water resistance. It is currently available in 30ml plastic or 80ml glass bottles or standard International sized cartridges and is reasonably priced.